This was my first time with the SewMamaSew Giveaway, and all I can say is WOW! I ended up entering about 100 different giveaways (I even one a few, pics to follow when I get them), and I found a few new blogs to add to my days. I don’t normally join as a follower (not sure why I don’t since I understand how cool it is to see that someone new is a follower). If you’re not aware of SewMamaSew, you have to go take a look. All November long they were posting daily links to great ideas to make or get as presents, and they host giveaways twice a year. I will be doing this again. Important! You have to have a blog. I will make a little something for the first FOUR blog owners who comment on this post. It will be a surprise and I will make it and send it to you some time during the next 365 days after you have commented. Make sure you let me know your email address, or that you aren’t a no-reply blogger so that I can get your contact details. To get a handmade present from me, you have to play too! This means YOU pledge to send a little handmade something to 4 readers of your blog. It doesn’t matter what you give, as long as it is handmade by you! Once you comment here, you need to post about your Pay It Forward on your blog(within 48 hours) to keep the fun going! *you can just copy the rules from me and please include the Pay It Forward badge in your post. Also, feel free to join the Flickr group to see what else is being sent! With Christmas approaching way faster than I want to think about, I was thinking about holiday traditions. Most of us have them, those things that just make the holiday seem real for us. I’ve given up a lot of the ones I had as a kid, or when my kids were young. Some were pretty normal, but we tend towards the odd and unique here, so there were some that no one else I know does. There are the rice people we got from a baby sitter in Denmark, little pipe cleaner people that got set up on December 1st. There was a little walnut shell cup that held a grain of rice for each one for every day until Christmas. Each night a portion of the rice would disappear, until it was all gone on Christmas morning. I remember being so mystified by that as a little kid. When my kiddos were little, we celebrated Christmas and Hannakah. No, not the tiniest bit Jewish. But it was fun introducing them to different ideas, and who doesn’t love latkes? And we would make about a ton of cookies. The one that was imperative was Mexican Wedding Cakes. I also got several cookie guns at thrift stores so that everyone could have their own for making Spritz cookies, and tinted the dough different colors for each one. Every year we all got a new ornament for the tree, a tradition started by my mom for me. My favorite has to be Christmas Eve dinner. We lived in Paris for 4 years when I was young, and the first year there my folks made the mistake of asking me and my sister what we wanted for Christmas Eve dinner. Being from Southern California, and having not been back to the U.S. for quite some time, we chose tacos. Probably not a big problem now, but way back then the px was not an option if you were not in the military (we were not). Somehow my dad managed to get a can of tortillas and some enchilada sauce, and we got what we had asked for. Somehow that idea stuck, and we still do it 40+ years later. One of my favorite memories of my sweetie’s dad was the first Christmas we were going to spend with him and his wife. I had made peace with the idea that I was going to have to forgo my tacos. The kids and SigOt went over the day before me, but I had to work that morning, so I ended up walking in the door about 4pm. His dad met me at the door, and asked if I would mind cooking. He had gone to the store all by himself and bought everything he thought I would need to make tacos for dinner. The kids admitted mentioning it, but he had made the decision all on his own, and I am still touched by his thoughfulness. Batts first. Each batt is 2 ounces. 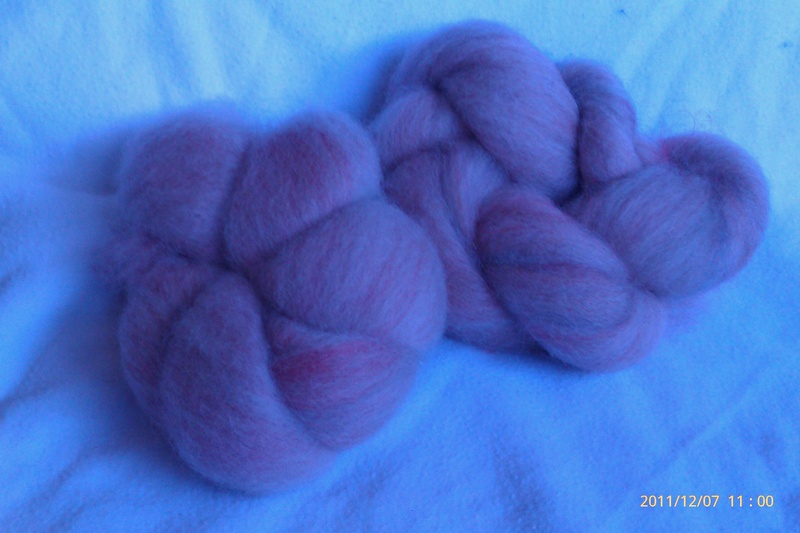 If you pick this you will get 2 batts (so a total of 4 ounces). All of these were done on my Patrick Green carder. First up is “Dying Embers”, superwash. 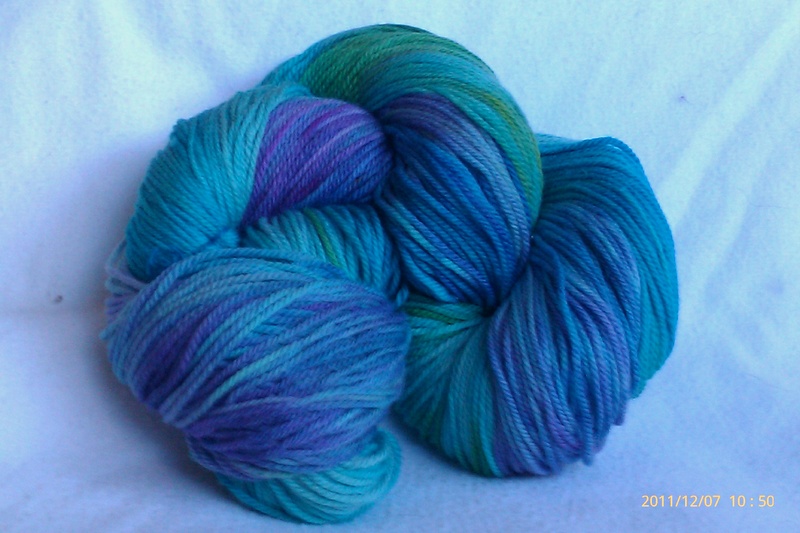 Next is “Tropical Waters”, also superwash. 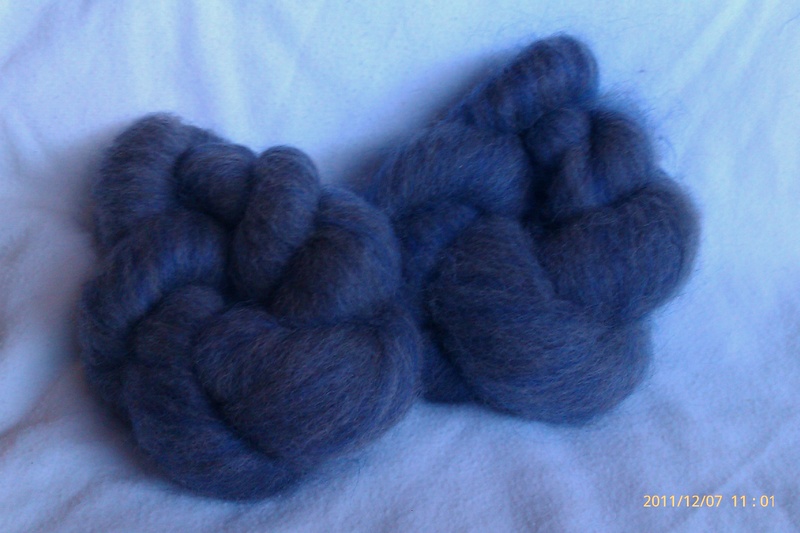 Then we have “Fire & Ice”, a blend of Romney cross wool and hand dyed mohair. 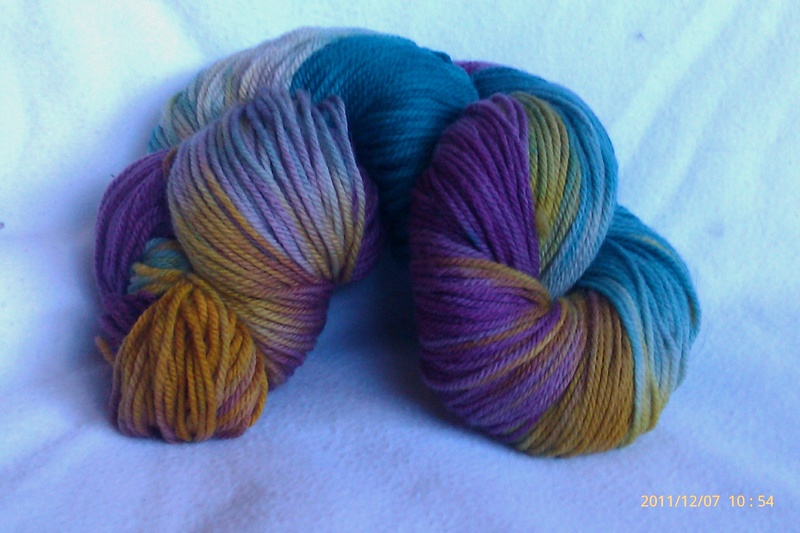 Now for the sock yarn choices. 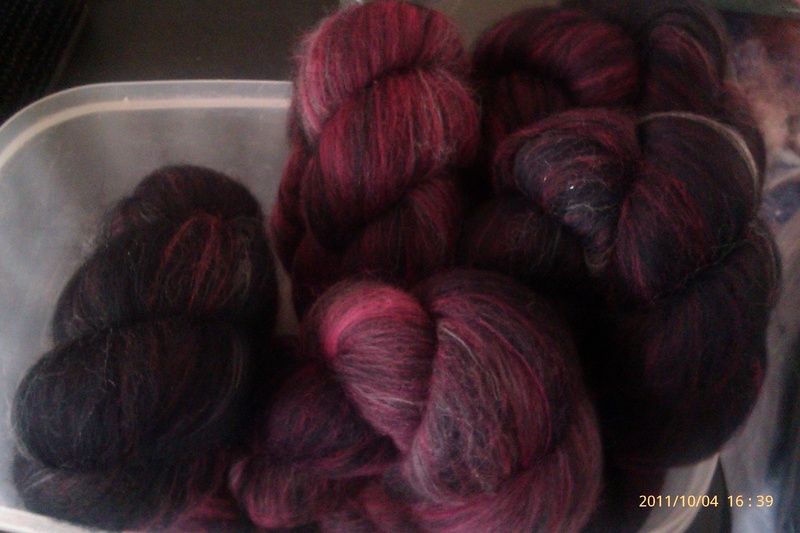 Each of these skeins is 4 ounces, 400+ yards, so plenty for a pair of socks. 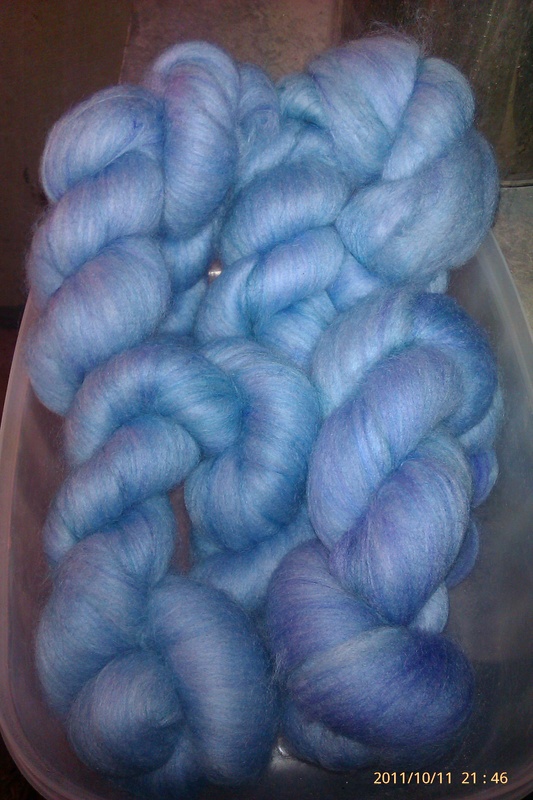 First up is “Peacock Feathers”, a blend of blues and purples. 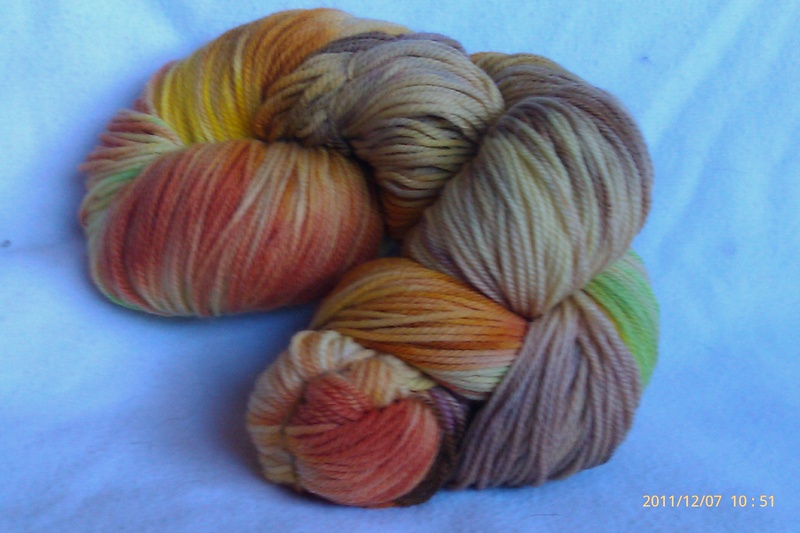 Second is “Autumn Leaves, a mixture of yellows, oranges and brown, with a hint of green. 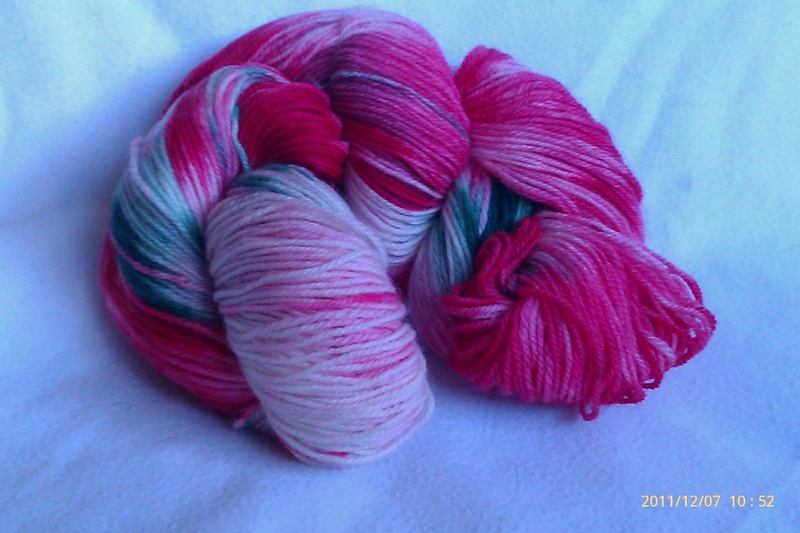 Third is “Strawberry Fields”, red, white and green. 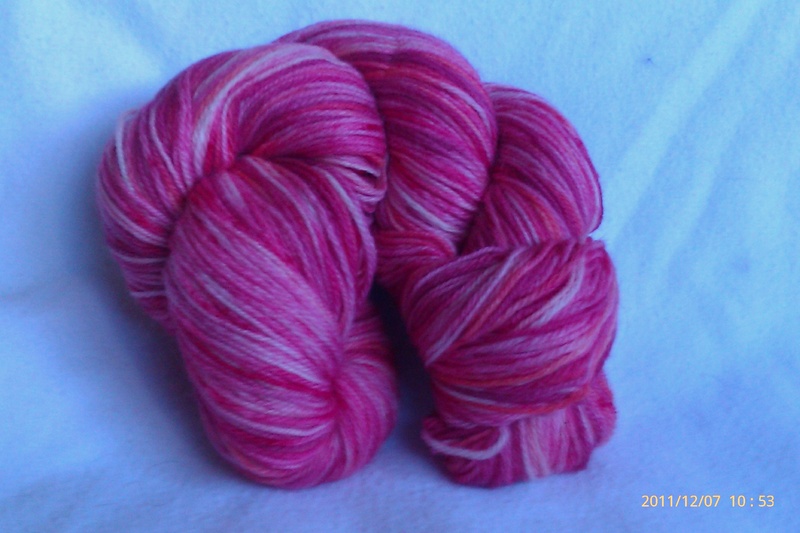 Fourth we have “Very Berry”, a mixture of pinks. And finally, we have “Victorian Christmas”, which is burgandy, gold, and pine green. ETA – Wow, I am overwhelmed by all the nice comments, and I love all the cool traditions you all have. Hopefully one or two of you will come back and visit from time to time, and I sure wouldn’t object if you wanted to get something from my Etsy store.